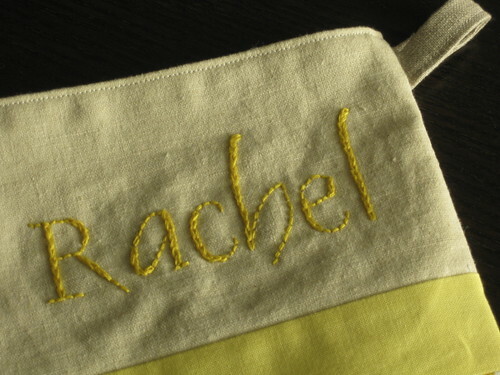 The next step was to embroider “Rachel” up top. Making use of a light table, I traced a print out of my name in “Dauphin”, one of my favorite fonts. To embroider this font, which has irregular thickness, I switched between a back stitch and chain stitch as I followed each letter. Such a portable project! I worked on it on July 4th while waiting for dark. 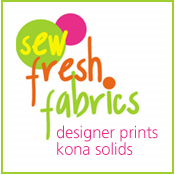 But, um, I had to take out all those stitches because I’d done them in full strand embroidery floss. Oops, gotta remember to separate those strands! Anyways, here’s the finished embroidery. 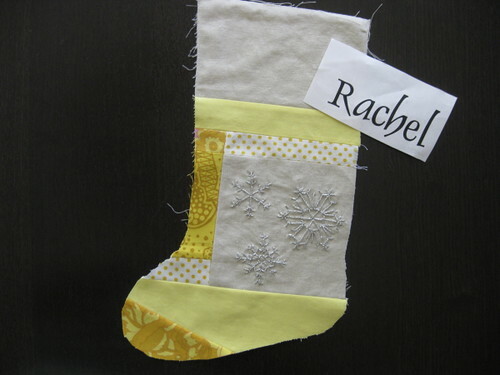 And, voila, my first finished patchwork Christmas Stocking! Now that I had done one, the next came more easily. Here’s Aria’s done in lots of Tufted Tweets and a little Heather Ross, Far Far Away. Aria’s been grumpy about my choice of fabrics for her stocking. She doesn’t understand why I’d use fabric with pictures of chairs and birds. You should hear her go on about the birds so disparagingly. Why not princesses and unicorns, mom? Sheesh. 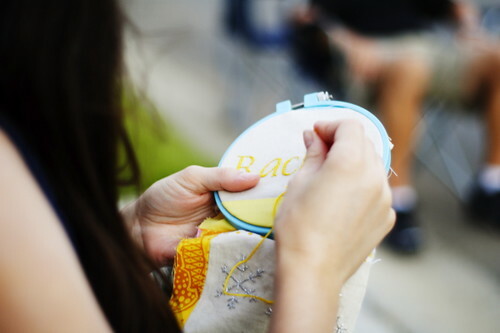 But, I won her heart with the embroidery. Her eyes lit up just imagining presents with sparkly silver bows! 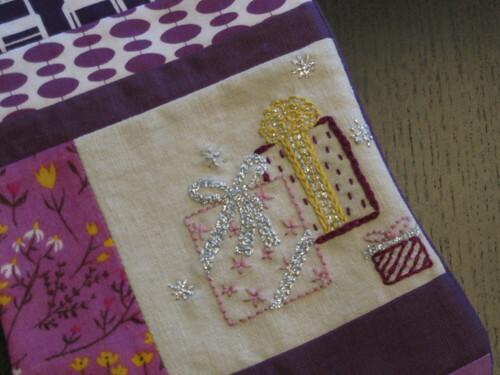 When I was finished, she smiled and admired her stocking, but did point out that the purple wildflower fabric (a scrap from her Far Far Away quilt) is her favorite. 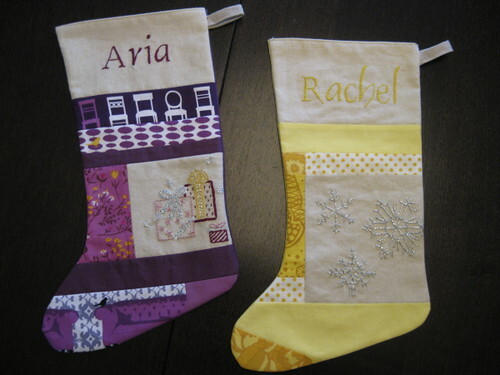 All in all these patchwork Christmas Stockings are a super-fun and relatively quick project. After the embroidery work is done, I can put together the stocking in one evening. I’ve used a piece of muslin as a base for the patchwork, which I sew on in horizontal strips after doing any piecing required. 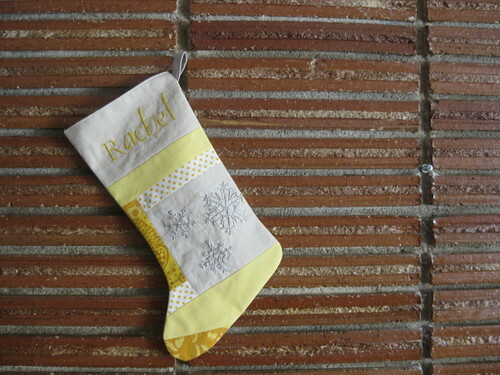 Each stocking is backed in a solid color and finished with a little linen loop for hanging. 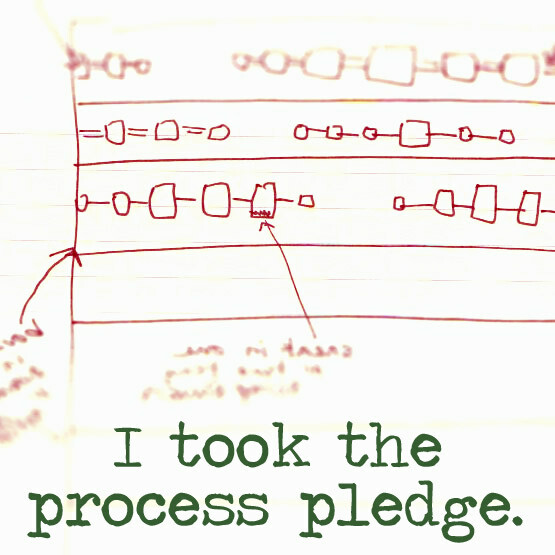 But, darn those loops – they’re the hardest part! It took me 5 tries to get the first one sewn on and 4 tries on the second one. It’s amazing how many ways there are to mess up the orientation of that loop! Several times I’d leave a little bit of the edge exposed on the right side of the seam. I even sewed the loop inside the stocking the first time I tried! 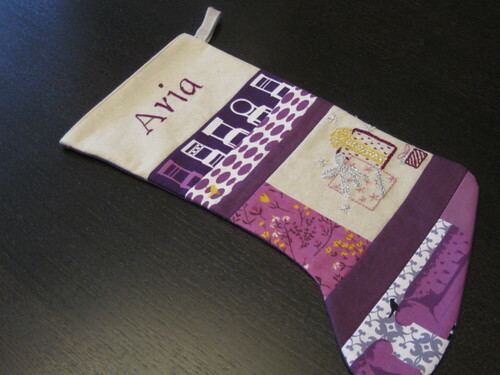 On Aria’s stocking, I sewed the loop on the wrong side of the stocking. These are the moments when I wonder how I ever did so well in school. But, now I have conquered two loops. Hahahaha (evil chuckle). Wish me luck on the next two.